← Are you transmitting illegally on 70cms? With the title to this entry, I can imagine a collective sigh from my readers, followed by “Oh no, not again”. This time is different though, this time it was nothing to do with RF or with melted insulators. A few weeks ago I decided to add some anti-bird measures to my aerial consisting of six bird repellant diverter discs. I’ve changed the method of mounting these a few times and I think I’ve sort of got it right now. I had problems with the discs getting caught on the elements but by moving the mounting position, I’ve resolved that. Two weeks ago, after some high winds, I noticed that there were only two discs left out of the six. I didn’t know what had broken, whether it was the clamps, the discs themselves or the cable ties holding them in place and it saddened me. Last week, while out for a walk, I spotted one of my missing discs on the grass area at the end of my road, around 100m away. When I checked it, it all looked intact so it appeared the cable ties must have broken. The next day, two more of the discs appeared on our doormat. Some kind neighbour found them and dropped them back to me. How does this relate to my broken aerial? Last weekend, I lowered the mast in order to replace the discs and also to modify the way the Hexbeam was mounted. I lowered everything before Tony, G0MBA came along to help and I accidentally dropped the mast too far and too quickly and managed to split the end section of one of the spreaders. These sections are under tension so Tony and I wound a number of thick cable ties around it to try and take some of the pressure off but as soon as it was back in the air, I realised I’d have to get it replaced. 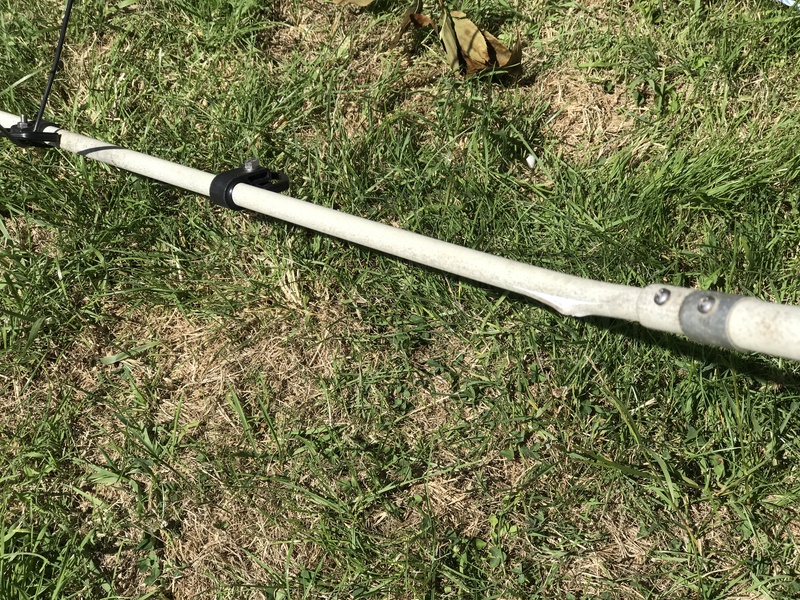 I emailed Ant, the original supplier of my G3TXQ Hexbeam and he put a replacement end section in the post to me straight away. This morning I lowered the mast, replaced the broken section and raised it again, all in about half an hour. As you can see, I’ve gone from using cable ties for the bird repeller to nice bright paracord. I use the same paracord (although in grey) to support my doublet. 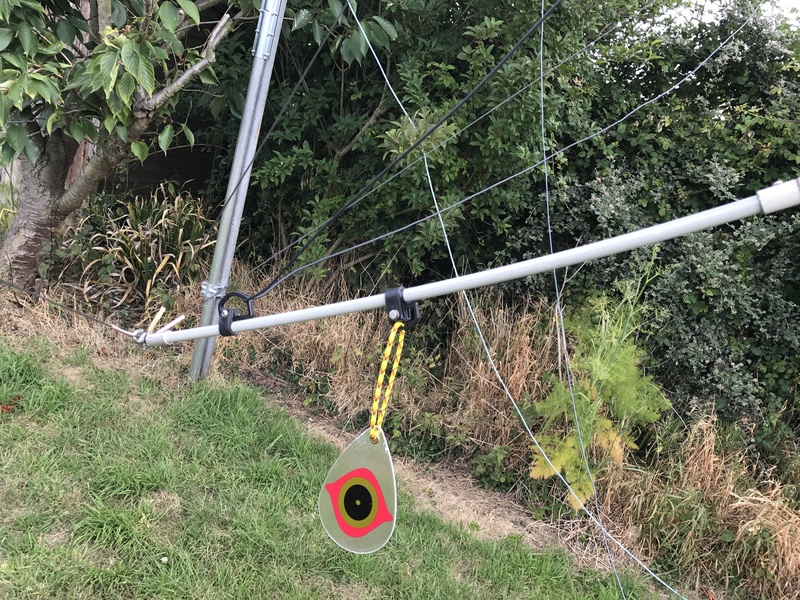 As an extra point, when I put the mast back up last weekend with five of the six discs on, the kids from next door knocked on my front door with the remaining disc. It had landed in their garden but they hadn’t realised where it came from until they saw the aerial go back up again with five discs on top. I have nice neighbours. I really can’t recommend the G3TXQ Hexbeam as made by Anthony, MW0JZE enough. It’s a superb design, an incredibly well made aerial and he continues to support it, even though I’ve had this for nearly six years. 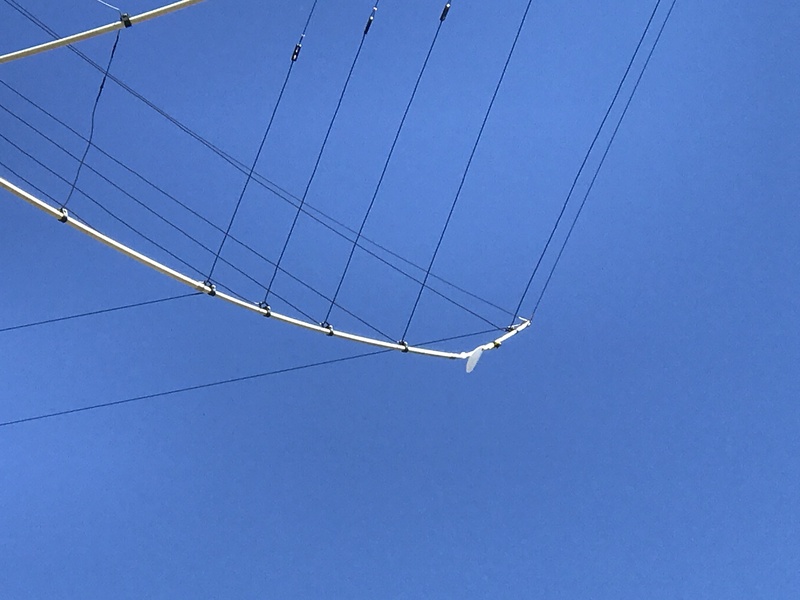 I know I’ve broken it many times (see the ‘broken aerial‘ category on this blog) but each time the design has been changed and the aerial has just got better and better. It’s larger than my old MA-5B but I still think the visible impact is lower because it just looks more pleasing than the spiky beast that is the MA-5B. If this aerial broke completely, I’d replace it with the same again without hesitation. This entry was posted in Amateur radio, Broken aerial, HF and tagged Broadband Hexbeam, Hexbeam. Bookmark the permalink.